STEPHENSON — Norway’s boys took the team title and West Iron County’s Emmy Kinner captured four events Friday in the Stephenson Lions Club Invitational track and field meet. Coach Al Trudeau’s Knights, 116.75, topped Stephenson and North Central, 105.75; Northwoods Storm, 87.75; West Iron County, 51, and Carney-Nadeau, 23. 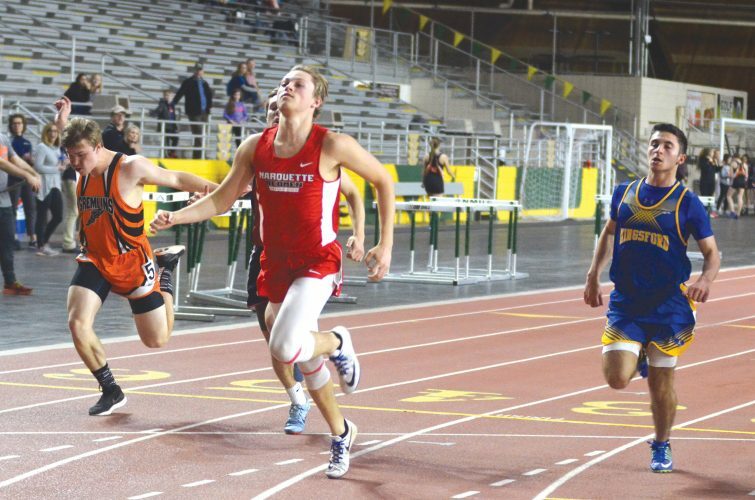 Norway’s Mitchell LeGrave (24.17) and Connor Ortman ran one-two in the 200-meter dash. The Knights also had firsts in the 110 hurdles from Inocenio Stankevich (16.85) and pole vault from David Loomis (9-feet). Northwoods Storm posted two firsts from Caleb Jones in 800 (2:10.76) and Brent Dumke in long jump (19-10.5). North Central distance runner Connor Robinson won the 1600 (5:10.23) and 3200 (11:17.98). Bryant Schram of West Iron County heaved the discus 101-0. Stephenson’s girls, 186, clipped West Iron County, 117, along with Carney-Nadeau 57, North Central 52, Northwoods Storm 36 and Norway 35. Kinner swept the sprints — 100, 13.27; 200, 27.50, and 400, 1:04.28 — and also won the long jump (16-2). The Wykons added another first from Rachael Tefft in shot (33-3). Norway’s Jaclyn Bal (19.11) and Libby Lofholm claimed the top two spots in the 100 hurdles.